The Sylphornithidae are tiny, long-legged birds, which were first described by Mourer-Chauvire (1988a) from the late Eocene (MP 16) locality Bretou of the Quercy fissure fillings. Of this French species, Sylphornis bretouensis Mourer-Chauvire, 1988, major portions of all limb bones are known (Mourer-Chauvire 1988a; Mayr 1998b). As noted by Mayr (1998b), the coeval and similarly sized Palaegithalus cuvieri (Gervais, 1848-1852) from the late Eocene of the Paris Gypsum, which was originally described as a passeriform bird, may also be a member of the Sylphornithidae. The very poor preservation of the only known skeleton of this species does, however, not allow a definitive assignment, and alternatively the fossil could be from a representative of the Zygodactylidae (Sect. 16.4.1). A further species, Oligosylphe mourerchauvireae, was described by Mayr and Smith (2002b) from the early Oligocene of Belgium and is based on a distal tarsometatarsus and tibiotarsus. Sylphornithids are well characterized by an extraordinarily long and slender tar-sometatarsus, whose distal end is very wide and bears short trochleae. The trochlea for the fourth toe exhibits a caudally directed wing-like flange, which indicates that the foot was at least facultatively zygodactyl. The carpometacarpus of Sylphornis bears a large intermetacarpal process similar to that of extant Piciformes and Passeriformes (Mayr 1998b). Sylphornithids differ from the equally long-legged Zygodactylidae not only in the absence of an accessory trochlea on the trochlea for the fourth toe, but also in the configuration of the other tarsometatarsal trochleae. In further contrast to zygodactylids, in sylphornithids the hypotarsus does not enclose a canal for the tendon of the flexor hallucis longus muscle. Mourer-Chauvire (1988a) recognized similarities in the hypotarsus morphology of Sylphornis and the piciform Galbulae, and a cladistic analysis by Mayr (2004g) also supported piciform affinities of the Sylphornithidae, which resulted as sister taxon of either the Galbulae or the clade (Pici + Galbulae). It is, however, well possible that future findings may lead to a revision of the phylogenetic affinities of these enigmatic birds. 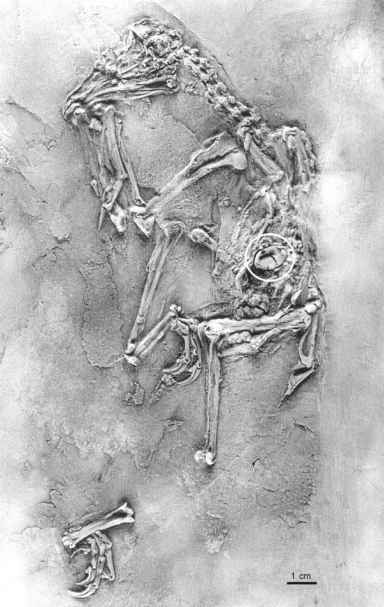 All Paleogene remains of the Pici come from Europe, and these fossils have a modern-type skeletal morphology. The earliest specimens, from the early Oligocene of Belgium and Germany, belong to species which are much smaller than any extant European Pici. A tarsometatarsus of a representative of the Pici was further reported from the late Oligocene of Germany (Mayr 2001f). The only named species, Rupelramphastoides knopfi Mayr, 2005, from the early Oligocene Wiesloch-Frauenweiler locality in southern Germany is represented by two partial skeletons, which constitute the most substantial remains of Paleogene Pici (Mayr 2005l, 2006g). R. knopfi is the smallest known species of the Pici, being smaller even than extant Picumninae. It is clearly identified as representative of the Pici by the presence of a very large and narrow accessory trochlea for the retroverted fourth toe, a very narrow tarsometatarsal trochlea for the second toe, and marked ulnar papillae for the attachment of the secondaries. In its proportions, the skull resembles that of the extant Scaly-throated Honeyguide, Indicator variegatus (Indicatoridae). A further phylogenetic assignment of Rupelramphastoides is, however, not straightforward. The tarsometatarsus is elongate as in many extant Ramphastidae, but the bill morphology shows that the fossil taxon is outside crown group Ramphastidae, which share smaller and more strongly ossified narial openings. The similarities between Rupelramphastoides and extant Ramphastidae may well be plesiomorphic for the Pici. Whereas the sternum of the fossil taxon exhibits a bifurcated manu-brium, which is a derived characteristic of the Picidae, the plesiomorphic absence of an ossified extensor bridge (arcus extensorius) on the proximal tarsometatarsus supports a position outside a clade including the Indicatoridae and Picidae (Mayr 2005l, 2006g).